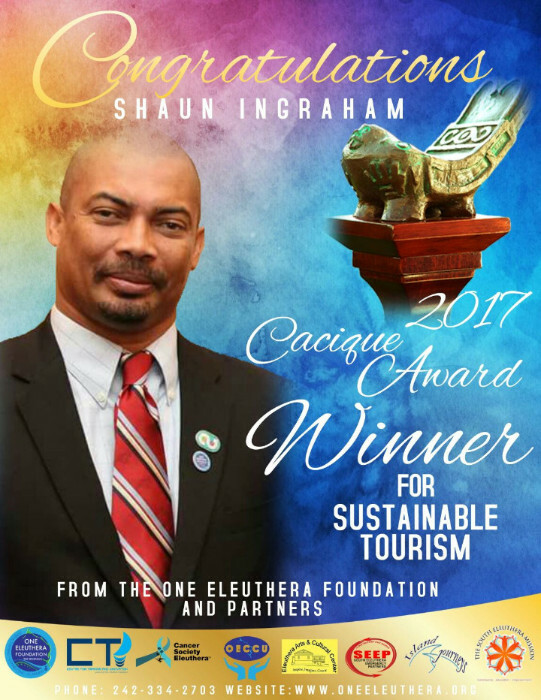 Nassau, Bahamas - On April 8, 2017 The 17th Annual Cacique Awards recognized Shaun Ingraham of the One Eleuthera Foundation as the Winner for their Sustainable Tourism Award. With a major seed investment from concerned citizens, residents, visitors and The Nature Conservancy, OEF was developed to implement concepts set out in A Shared Vision for South Eleuthera. This plan was developed in 2010 as a response to the proposed large scale development of the beautiful Lighthouse Point on Eleuthera. One of the goals of this non-profit organization is to encourage Eleutherans to recognize their natural and cultural assets and take ownership of the island's sustainable development. This would be done by stakeholders collaborating to develop a plan and share resources. As the plan recognizes the need for tertiary level education on the island, the organization recently acquired the Rock Sound Club, a once popular 20 room hotel, which has not fully functioned for 30 years. The newly acquired property is being transformed into the Centre for Training and Innovation (CTI). Over the past 18 months more than 60 students have been enrolled in a Learn and Earn Program. Students are given a stipend that allows them to learn a trade while they earn a wage. Areas of focus include Hotel and Tourism Management, Plumbing, Carpentry, Electrical and Landscaping. With an aim of improving food security, sustainable agriculture and affordability of produce on the island of Eleuthera, the program also has an agriculture component with an active farm, another objective of A Shared Vision. CTI seeks to expand into the agri-tourism market. It should be noted that CTI is now the only training hotel in the country. Prior to founding OEF, Shaun was also instrumental in founding Methodist Habitat, an organization dedicated to service learning for visitors, Island Journeys, a destination management non-profit, the Eleuthera Arts and Cultural Centre, South Eleuthera Emergency Partners, emergency services and the One Eleuthera Cooperative Credit Union. Shaun has also given support to the development of Cat Island United. Another environmental organization operating on Cat Island. Upon receiving the award, Mr. Ingraham shared that, "It feels really good, but it really is a team effort! Lots of people sacrifice every day. "We have a hard-working staff who have bought into a vision not only for Eleuthera, but for the wider Bahamas. A vision of how change can happen from the ground up." Impressively, One Eleuthera's initiatives align with 15 of the 17 United Nation's Sustainable Development Goals. One Eleuthera has partnered with many local and international environmental agencies such as The Nature Conservancy, Bahamas National Trust, Inter-American Development Bank, Global Environment Fund (GEF), The Island School, Ministry of Tourism, BREEF, Leon Levy Native Plant Preserve, Pineapple Fields, Island Journeys, Clemson University, Clemson SC, UMASS/Amherst. For more information on One Eleuthera Foundation, visit our website at www.oneeleuthera.org/ or email us at info@oneleuthera.org. About the Cacique Awards: The Cacique Award is a highly prestigious award and is presented to industry leaders who are Tourism's finest in the islands of The Bahamas. The Sustainable Tourism Award focuses on an individual, organization or group that have developed a tourist attraction or facility for the enjoyment of our visitors that promotes harmony with the environment.